Playa Del Rey, CA (October 19, 2018) – Reindeers are to December like pumpkins are to October. That’s how kids and their parents think. You can’t really snuggle with a pumpkin but one in-demand gift set, Reindeer In Here, is all about hugs and wishes. It’s also about to become THE most demanded plaything based on last year’s Black Friday sales, the news media and the toy experts. In its first year in retail, 1200+ retailers are stocking this award-winning plush & book gift set before another anticipated Black Friday sell out. Reindeer In Here, is capturing the hearts of America and creating positive family memories for the new modern family. Toy industry forecasters have awarded Reindeer In Here nine (and counting) national honors since its debut. It is now the Most Awarded Christmas Tradition Brand of 2018. Beyond the gift set of an enchanting book and a soft plush reindeer, is a tale for children to hear again and again: being different is normal! Turning the page, children discover a snowman with a candy cane nose, there are two cross-eyed penguins, one wearing glasses, a polar bear sprouts just three hairs on his head, and a little reindeer with two mismatched antlers gives Santa his best idea yet! Reindeer In Here’s beautiful box set made its debut on Black Friday 2017. In a matter of TWO hours, it completely sold out on Amazon! The gift and toy industries grabbed a few copies and began anointing it as the next big thing for Christmas cheer. Like Christmas itself, celebrations and traditions are global. And the demand for Reindeer In Here has soared. According to Reindeer In Here’s Reed, current international distribution agreements have been met with South Africa and Canada. Talks are in the works with UK, Australia, Ireland and other international distributors. 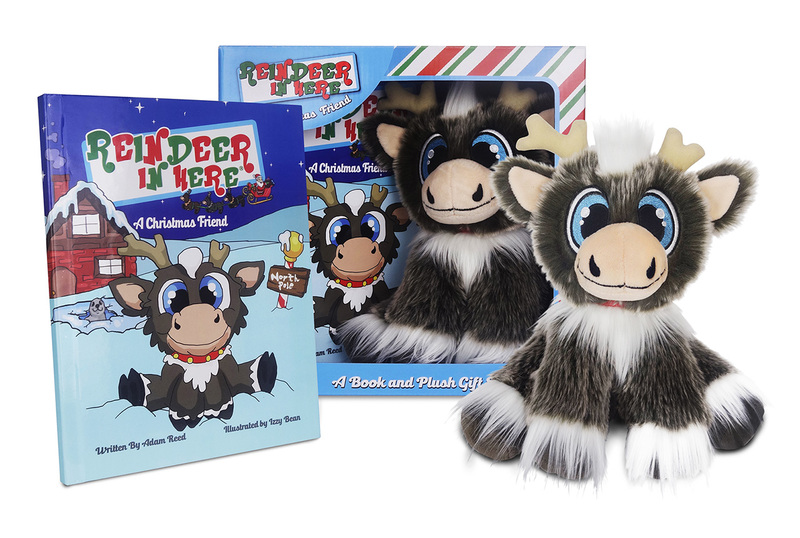 In early December the Reindeer In Here book and plush “magically” arrive for your child, setting the stage for a new yearly Christmas tradition. It’s their first gift of the holiday season from Santa — and it came early! As the parent surprises their child with this unexpected early Christmas present, they introduce them to the special untold story of the reindeer. On Christmas Eve, the child will put their reindeer under the tree so it can greet Santa. After Santa finds the reindeer, it will go with him to guide his sleigh back to the North Pole until next year — when the child’s Christmas reindeer will return in early December to see its friend once more! This holiday tradition will unfold for many years to come as the child looks forward to that magical time of year when their very own special Christmas friend comes back to see them again! Although never intending to be an author, Adam Reed has always been a storyteller. When not being a dad, he is CEO of Los Angeles-based Emmy nominated production company, Thinkfactory Media, one of the most prolific scripted and unscripted production companies in the business. He has created and produced over 500 hours of television. Adam lives in Playa Del Rey, CA with his wife and two children – his daughter Peyton and son Weston, whom both of his books are dedicated to. For more information, visit Reindeerinhere.com.